What is the Timeline for Alcohol Withdrawals? The phases of Alcohol withdrawal and the symptoms involved occur when one has developed a dependence on alcohol and abruptly quits. Alcohol dependence results from the excessive ingestion of Alcohol which alters the brain chemical make-up and functions and even structure. When one abuses Alcohol on a regular basis, their brain attempts to compensate by adjusting its neurotransmitter activity. Neurotransmitters in the brain communicate information throughout the body and brain. As a depressant, Alcohol initially enhances the effects of the neurotransmitter GABA, which produces feelings of relaxation and well-being, and decreases the effects of glutamate, a neurotransmitter that produces feelings of excitability. But when occasional drinking transitions to chronic Alcohol abuse, the brain attempts to maintain normal function despite the presence of Alcohol by suppressing GABA and increasing glutamate. While the brain continues to adjust its chemical activity, the need for higher doses of Alcohol is increased in order to achieve the desired effect. This is building a tolerance and dependence and potentially an addiction. Eventually, the brain will begin to function more comfortably when Alcohol is present hence creating a dependence on Alcohol. 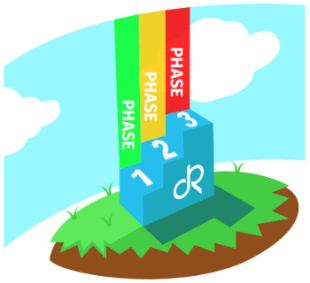 Of all the stages, Phase 3 has the most dangerous withdrawal symptoms one is Phase 3 when the delirium tremens or DTs begin. One major symptom of DTs are tactile hallucinations, where one feels an extreme itching, burning or numbing sensation for no reason. Oftentimes mistaken for a rash due to the severity leading many Alcoholics feeling as though they have bugs crawling under their skin. The sensation leaves the Alcoholic scratching incessantly causing severe skin damages from the Alcohol withdrawals. The causes of the itching when going through the phases of Alcohol withdrawal are still not completely understood. Some medical professionals have stated that perhaps the tactile hallucinations are a result of the central nervous system reviving itself after having been numbed by Alcohol for such an extended period of time. The effects of the Alcoholism on one’s physical health is far to often underestimated. What are the Three Phases of Withdrawal from Alcohol? Mild Alcohol withdrawals can begin as early as 6 hours and as late as 24 hours after the last drink. These early symptoms will typically intensify and then subside within 24 to 48 hours. Medications are commonly prescribed that can help ease many of the early Alcohol withdrawal symptoms. Between 24 and 48 hours after the last drink, more intense symptoms begin to resonate. Adrenergic medications may be used to treat elevated blood pressure and pulse rate and anti-seizure medications may also be used which may also help with the depression, anxiety, and irritability. Delirium Tremens, or DTs begin within 48 to 96 hours after the last drink. May experience extreme itching, burning and/or sensations of bugs crawling under skin. Antipsychotic medications may help with impulsive behaviors, hallucinations, and lower risk seizures. The phases of Alcohol withdrawal symptoms typically set in within 6 to 24 hours after the last drink. Symptoms range from mild to severe, depending on age, the amount of time spent abusing Alcohol, and the amount of Alcohol in the body’s system at the time detox begins. Not everyone will necessarily experience all the symptoms of the stages of Alcohol withdrawals, but it is inevitable that they will at some point experience intense cravings for Alcohol. Inpatient Alcohol detox involves staying at a residential facility during the phases of Alcohol withdrawals. Inpatient treatment programs offer the best chances for success and are the safest option for withdrawal. Inpatient detox is essential for those who have a long history of Alcoholism, a history of withdrawal seizures, co-occurring disorders, and or little support at home. Inpatient detox offers a high level of emotional support and around-the-clock supervision during the stages of withdrawing from Alcohol. Because many people who are dependent on Alcohol have vitamin deficiencies and other health problems, inpatient programs put a strong emphasis on good nutrition and adequate hydration. Inpatient detox allows you to focus on getting through the phases of Alcohol withdrawal comfortably and without external stresses and triggers that can quickly lead to a relapse. Outpatient detox involves visiting a detox center each day to discuss the symptoms of Alcohol withdrawal and monitor any medications being used. Outpatient treatment can be successful for people who are facing the stages of Alcohol withdrawals for the first time. Outpatient detox offers a higher level of privacy than inpatient detox since there’s no need to explain an extended absence. It allows you to continue working, attending school, or caring for the family while ending your dependence on alcohol. The Principles of Effective Treatment set forth by the National Institute on Drug Abuse make it clear that while detox ends the stages of Alcohol withdrawal and physical dependence on alcohol, it doesn’t address the addiction. Dependence and addiction aren’t the same things, and detox is only the first step in addiction treatment. Alcohol Addiction is characterized by the inability to stop drinking even though it’s causing problems in your life, including health, relationship, financial, and legal troubles. It’s when one experiences the phases of withdrawal from drinking Alcohol because they’ve grown physically and emotionally dependent upon the substance. It develops when the brain makes ironclad associations between using Alcohol and the pleasure it produces. As the brain begins to associate enjoying Alcohol with needing it, the result is intense cravings that lead to compulsive use. The brain changes that occur with Alcohol addiction–particularly in the learning, reward, and memory centers–also affect thought and behavior patterns, leading to dysfunctional thinking and risky behaviors. Treating an addiction to Alcohol requires addressing the various issues that underlie the Alcohol abuse, which may include a mental illness like anxiety or depression, a history of trauma, chronic stress, or family dysfunction. It requires developing essential skills and strategies for coping with cravings, stress, and other potent triggers for relapse, and it requires finding purpose and meaning in life and learning how to have fun and enjoy yourself without Alcohol. Cognitive Behavioral Therapy or CBT is the cornerstone of addiction treatment and avoiding the stages of Alcohol withdrawals. It helps you sort through your unique issues, and it helps you identify self-destructive thought and behavior patterns and learn to think and behave in healthier ways. Of particular concern is the effect Alcoholism has on children. It is known that children from Alcoholic households, be that with one or two drinking parents, are more likely to have behavioral problems, anxiety, and other emotional issues. Going through the timeline of Alcohol withdrawal is a wake-up call. Recovery is a process of change that will improve an addict’s health, life, and goals. Once the phases of withdrawal from Alcohol finishes and the physical dependence is broken, treatment is crucial for sending the addiction into remission for the long-term. Hope is the belief that a better future is possible, and it’s the foundation of recovery. But just as it takes time to develop an addiction to Alcohol, it takes time to establish new thought and behavior patterns and make lifestyle changes that support a life in recovery. Setbacks are a normal part of this process and holding onto hope throughout detox, treatment, and early abstinence–and focusing on the progress you’ve made so far rather than any setbacks you’ve experienced–is essential for successful long-term recovery. Get copies of our Infographics Here! and spread awareness to prevent substance abuse and addiction.